The Rebel Sweetheart. : Today's Look | Green Eyes and Plum. Green was never my favorite color, so I have to admit - buying this product was like taking a shot in the dark. But considering its price of Php 175, I thought 'what the heck, let's give this a try for the sake of beauty blogging'. Almay Intense i-Color Trio for Greens. I'm glad I didn't let myself be intimated by that dark green shade in the middle. Because this palette turned out to be very interesting and fun to work with, given the proper mixing and matching of colors, plus a good set of makeup brushes. These are my tools, in case you're wondering. Personally recommended by Tita Mac (she uses a similar set), these unbranded brushes have really soft bristles that feel gentle once they come in contact with your skin. 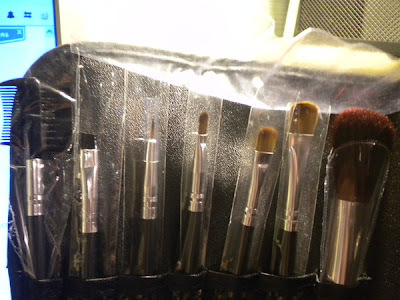 They don't have this weird smell which is the common downside of cheap(er) makeup tools. And they're pretty easy to clean, too. As I have mentioned in my previous post, these greens can create a smokey eye look. They turned out to be a great variation from the traditional blacks and grays. I love how Almay eyeshadows are long-lasting (they last for more than eight hours on me since I don't have oily skin), and they tend to set better on your face the longer you wear it. Greens and plum experiment - success! I chanced upon some Ever Bilena products while at Watson's the other day (these beelines at Watson's will eventually cause a dent in my wallet, I tell you). I've read good reviews about their products, so I decided to give their Perfect Eye Concealer a try. I need to explore more concealer brands because my eyebags are beginning to be a hopeless case. Coupled with my already deep-set eyes, an incurable insomnia, and my addiction to Kdramas, they make a pretty lethal combination - detrimental to my vanity. LOL! Zooming in for a closer look. Plum on the lower lid, dark green for highlighting, light green swept all the way to the browbone. What I liked about the Ever Bilena concealer is it's finish - basically flat and one-dimensional. It doesn't reflect light whatsoever, so when taking pictures, you'll have none of those odd-looking white swatches on your face. It's a bit tricky to apply though, because of its gel-like consistency plus the fact that I'm not using a primer (must get one soon). Don't even think of using a brush to spread the concealer underneath your eyes. It wouldn't work. You have to gingerly use your fingers instead. The shade is a tad unusual, too. I got the CO1 Light, which is the lightest of the three shades available, but I still find it to be a bit dark for my light skin. I made the necessary adjustment by topping it with a few dots and feathery strokes of my Avon concealer. In the end I still had to use my old concealer, blah. Or perhaps I expected too much from something worth Php 100. My Avon concealer in Almond vis a vis Ever Bilena in Light. I was very pleased with how this experiment turned out. It's not something I'll wear everyday (I mean, hello? This face while lining up in the supermarket? Har! ), but steering away from my conventional colors was definitely a commendable first. Being bold and daring sure has its perks. Thanks for the compliment, I do appreciate it. pretty :) ako kasi hindi gumagamit ng make up ever since kasi naman ang panget ng effect sa skin ko, nagsisilabasan mga zits once naglagay ako... hihihi.. Nice!!! I really like your posts. I am following from the Reflexion Hop.Please stop by Lioness Rebirth. Wow i am impress you did a good job. Visiting from COPS! awww you look beautiful Sis Rebel, what a combination of the eye shadows. I wish I know how to apply eye shadow and other make-up, I tend to buy but never try it. This is stinks when you are born to be simple :-( Visiting from Crazy over purple Saturdays, hope that you can return the visit too.